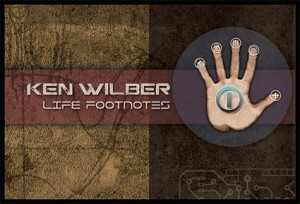 A couple of years ago we received notice of the Ken Wilber Life Footnotes project. Not knowing quite what to expect we subscribed to the series for a very modest sum. Some months later we received the first ‘volume’ of 22 mostly short video clips of Wilber speaking about his life and work. Far from being naive ‘Wilber fans’ we immediately saw the value of this material. There’s nothing quite like letting someone speak for themselves and Wilber has the ability to do so clearly and succinctly. Each of the short sections deals with a particular stage of his work and output. So, in effect, what the clips represent is a series of author’s reflections on key aspects of the works. If nothing else this provides a valuable step-by-step, or stage-by-stage, overview of Wilber’s output and the development of his thinking over several decades. We transferred the clips to an iPad and watched / listened to them over several weeks at our own pace and in our own time. Volume one goes all the way from Wilber’s childhood, through his early works and up to an item on the pre/trans fallacy. Volume two, which arrived a while later, contributed another nine sections. It is themed around ‘Freya’s Story’ and includes a rare clip of her speaking from the heart at an event. You don’t have to be a dyed-in-the wool admirer to see that the Life Footnotes project is a profoundly valuable addition to the written and web-based corpus of Wilber material. It provides a new and accessible avenue into his work and a superb précis of the path he has followed. Contact Integral Life for further details.